The English Springer Spaniel is an affectionate and easy-going family dog, and its alertness and attentiveness make it the ideal hunting companion. 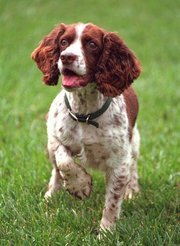 As a member of the AKC Sporting dog group, the English Springer Spaniel is considered a gun dog breed generally used for flushing out and retrieving game. An intelligent dog, and eager to please, a Springer is easily incorporated into a family setting. Although good with children, it tends to have a moderate to high energy level. Because of its long-legged build, the English Springer Spaniel is among the fastest of the spaniels. It has unlimited stamina and needs plenty of exercise and activity to keep its mind focused and body healthy. English Springer Spaniels are playful animals; many owners find humor in their play. As with many playful dogs or hunting dogs bred as retrievers, these dogs will play with things as simple as empty plastic bottles, socks, or towels. These spaniels easily remember where such things are kept and are good at getting them out. Some people say that English Springer Spaniels are like velcro, because they want to be in the immediate vicinity of their owner. If the owner walks to the other side of a room, so does the English Springer Spaniel. As in many dog breeds there are health issues for which the breeder should be careful. People acquiring new puppies can avoid some issues by asking the breeder for health clearances of the father and mother of the litter, in particular, Canine Eye Research Foundation (CERF) and Orthopedic Foundation (OFA) certifications for the father and mother. However, health issues can still show up. Hip dysplasia and Progressive Retinal Atrophy (PRA), are two such diseases for which veterinarians are working on genetic markers to determine carriers. You may also want to consider pet health care insurance for your English Springer Spaniel to help defray any high medical expenses you may incur. In light of the recent pet food recall, many pet owners are now looking for alternative diet's to feed their pets. We have several articles in the pet health section to help dog owners find better dog food for their pets. Training your English Springer Spaniel is simple and very effective. It should also be fun for you and your dog, it doesnt have to be hours and hours each day just may be 5 minutes or so. There are many aspects to dog training that dog owners need to look at if they want their dogs to behave properly and also stay happy.